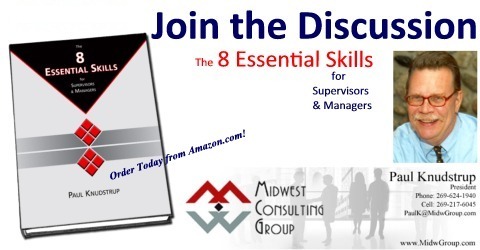 The book that has become The 8 Essential Skills for Supervisors & Managers has been hanging around in my head for a long time. I was busy and pretty satisfied with running Midwest Consulting Group, Inc. – interesting, fulfilling work teaching people how to effectively manage themselves and their teams, have a successful personal life, and maintain a sense of humor. And yet, like many of you, I had this book inside, wanting to get out. With the book written and in final editing I can turn my attention to getting the word out and looking toward the next project, the next book. The decision to get to work with the writing was actually made for me by the arrival in the fall of 2008 of the Great Recession. Since 2000 MCG’s training and development business had steadily grown to the point where I was on the road a great deal of the time, conducting week-long management courses for a variety of clients as well as shorter one or two-day workshops. I loved the work but after 9/11/2001 the hassles of business travel seemed to grow by the year. The economic meltdown that arrived in late 2008 resulted in a similar meltdown in the training and development arena as organizations of all kind were forced to trim their budgets, reduce head count, and batten down the hatches . . . or go out of business. Life provides you with choices every day. The day the economic chickens came home to roost after nearly a decade of upheaval, change, and not a few poor choices on the national scene provided me with big choices. The 8 Essential Skills is the result of those choices. Now we’ll find out if anyone else is interested.